Funeral Flowers from LIZA'S GARDEN - your local Huntington, TX. 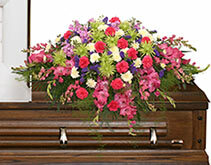 Let LIZA'S GARDEN deliver a lovely floral expression of sympathy and reverence for you. This arrangement features white roses, Fuji mums, gladiolus, lilies and bells of Ireland. Words are sometimes hard find when a friend or loved one passes. Often, flowers better define the sympathy we feel for the family and our lost friend. LIZA'S GARDEN can help you communicate your feelings through flowers. From a small memorial urn to a lush standing spray, this simple gesture of support can mean a lot to a grieving family. 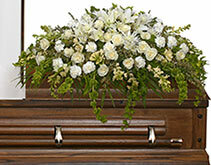 Whether you need delivery to a house or a funeral home, LIZA'S GARDEN can help with all sympathy flower needs.